Virtualization is being rapidly adopted, particularly in small to mid-sized businesses (SMBs) where time and money are always at a premium. Virtualization offers many benefits including saving time, money and labor in a variety of areas, including procurement, administration, deployment, operations, reliability and recoverability. However, like any technology, virtualization brings challenges that can erode its cost benefits and leave the infrastructure less protected than before. 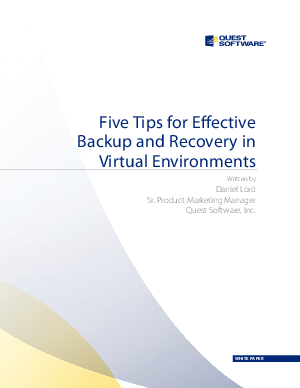 In this white paper Quest’s data protection experts offer five tips for effective backup and recovery to help you avoid the challenges that might keep you from fully protecting your virtual assets and infrastructure.